From July 3-7, 1997, the Livermore Tri-Valley Stargazers went on the legendary White Mountain trip. East of the Sierra Nevada, at an altitude of 3800 m (12500 ft) the University of California operates Barcroft Facility, a high-altitude research station. With virtually no light pollution, this place is ideal for astrophotography. Some years ago, White Mountain was even considered as a possible site for the 10 m Keck telescope! 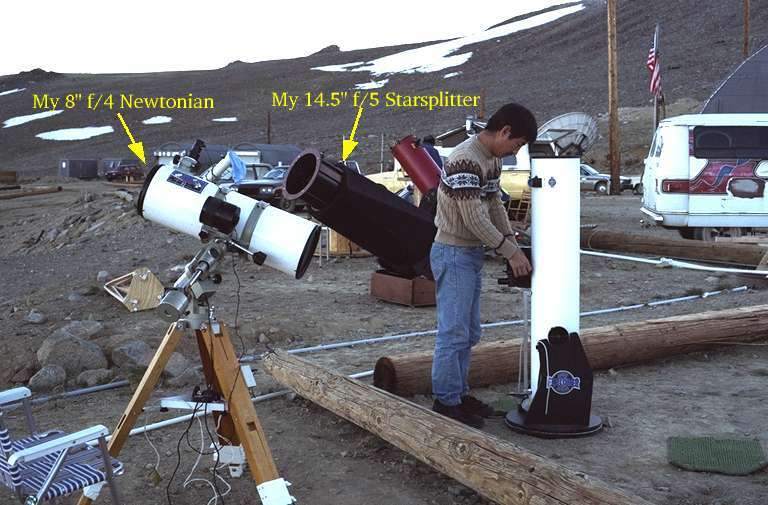 Take a look at my telescopes at Barcroft. A tour of Barcroft Station. Head of Scorpius with nebulosity around Antares and rho Oph.